After our lovely long week in Tenerife, as soon as we touched down at Luton Airport we were on the train. 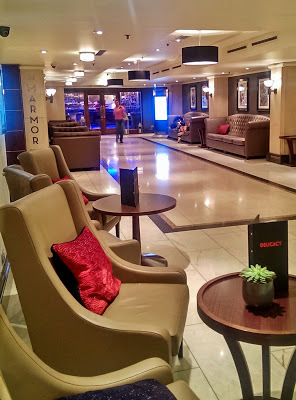 But we weren’t heading home, Liam and I went straight into Central London as I’d booked us a night at the Thistle Marble Arch. Before we’d booked Tenerife I had already bought us tickets to go and see You Me At Six live at Alexandra Palace. And then when Liam was given a week off work (he’s in the Army so doesn’t get to chose his time off) the week before the gig, we had to cram the holiday and London into one long 9 day stretch. 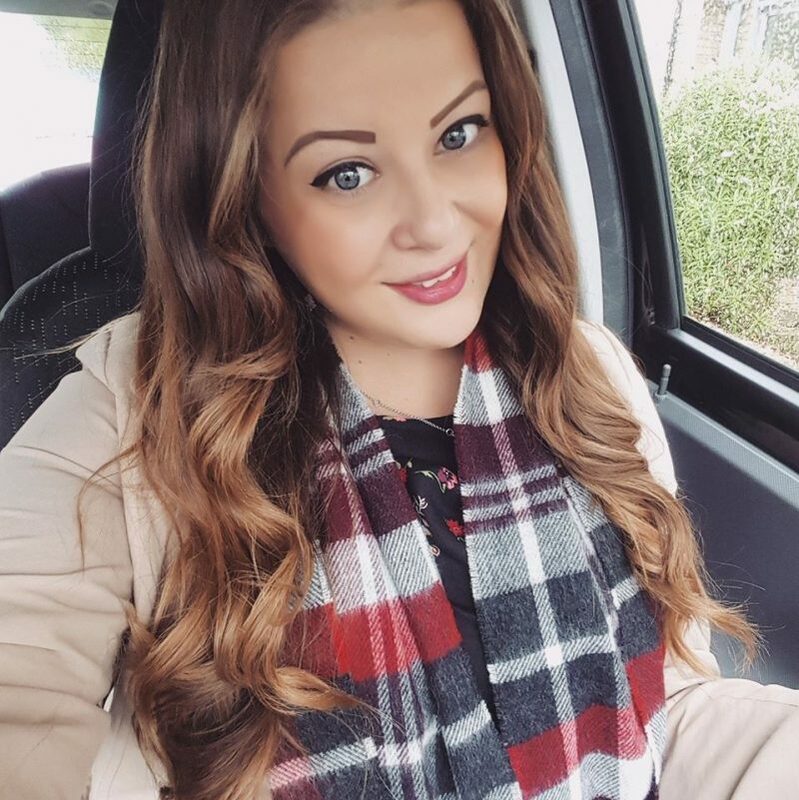 So once we go into London we first went to go some food, as we’d been up since 4am for our flight at 6am, and once we had landed in the UK and rushed into London it was definitely lunch time. 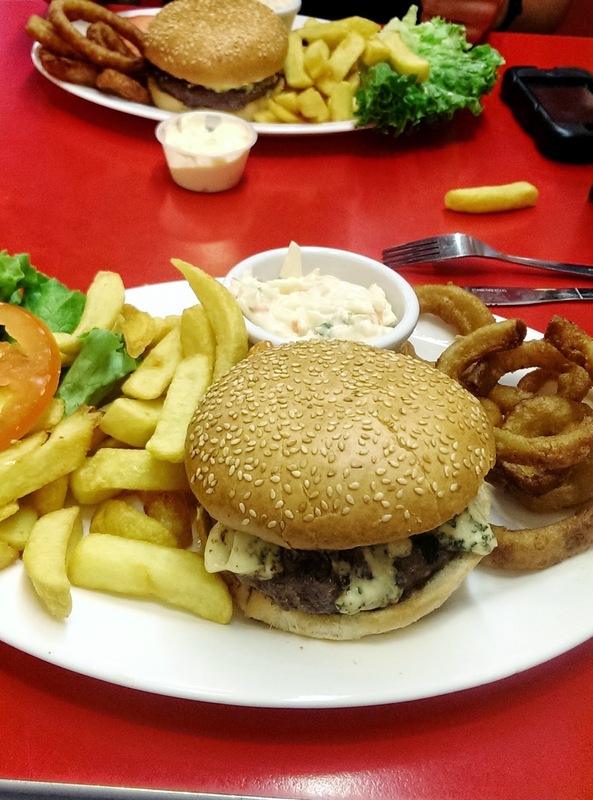 Ed’s Diner is always a favourite of ours, and we went to their Trocadero restaurant near Leicester Square. I love their food as you can get a big plate including a (amazing) burger, fries, onion rings, and coleslaw for only £10 and their milkshakes are big enough for two, £4 and the most delicious thing you will ever taste. It’s perfect for a casual relaxed meal, and the atmosphere is always great, and I love their retro furnishings. 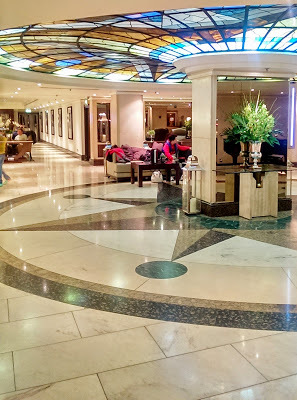 After lunch, we went to check in at our hotel, which is right at the end of Oxford Street, near to the Marble Arch. 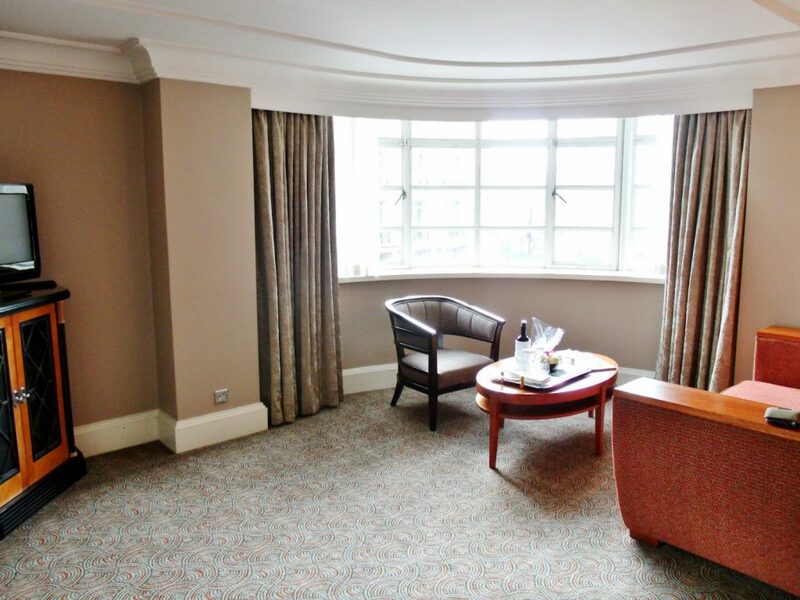 Our room was on the corner of the building and was facing the Marble Arch and overlooking the main road. It was great to have such an interesting view over one of the busiest parts of the city, albeit a little bit noisy. Our executive bedroom was very spacious; it included a little hallway when you walked through the door, and then a large living room area, with the bedroom behind it. 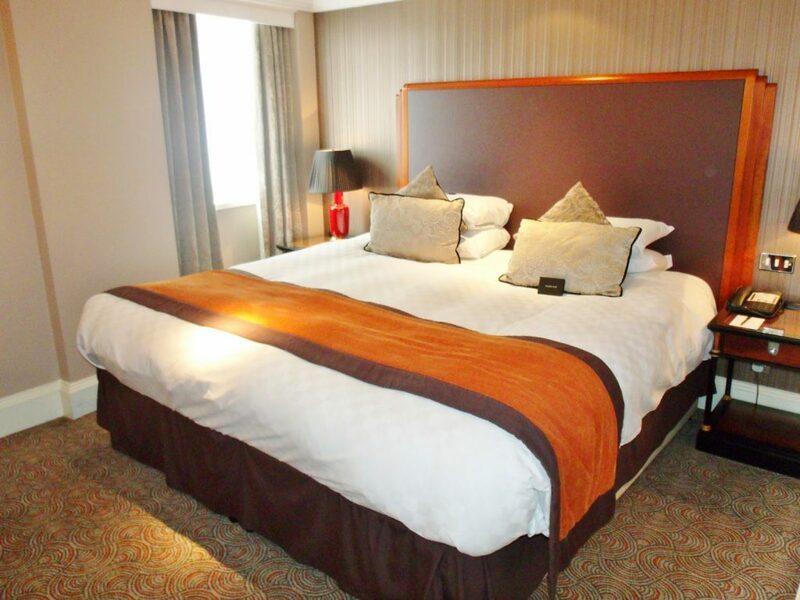 The bedroom included a large desk with another TV on, and a big comfy double bed. 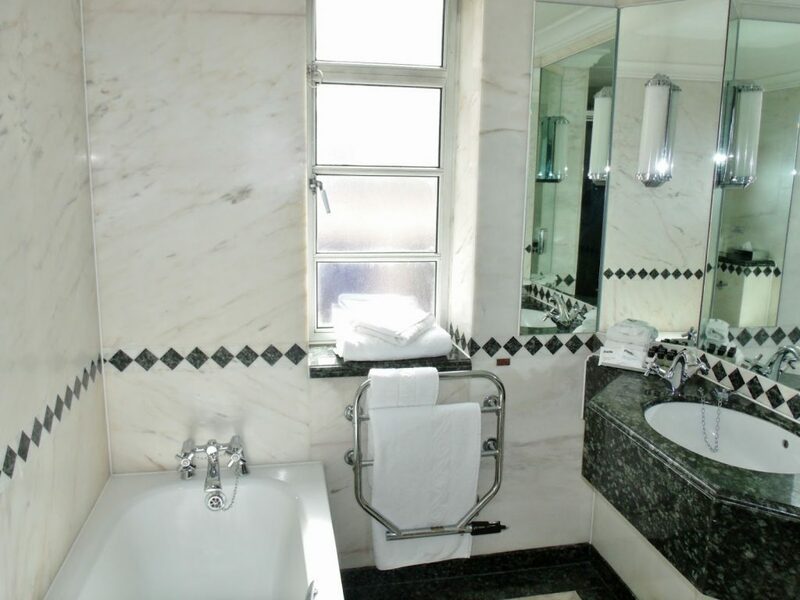 The bathroom had both a bath and a separate shower, as well as large fluffy towels, dressing gowns, slippers, and toiletries. 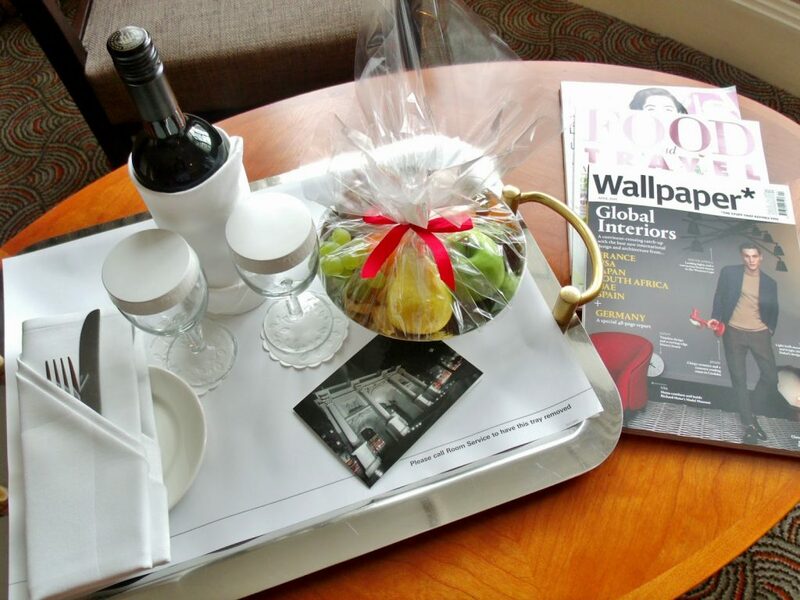 There was lots of extras in the room, such as a personalised postcard, a fruit bowl, a bottle of wine, a box of chocolates, magazines, mints on pillows, and a filled tea tray and fridge with glass bottles of cold water. It was great to feel so well looked after! The only negative regarding the room is that it was a little bit dark; although the living room had a large window, the bedroom only had a tiny little window that didn’t let in much light, and the decor and wood was all very dark. Once we were settled into the hotel, we were on the move again as we got on the tube to Alexandra Palace to go to see You Me At Six. The gig was filled with emo teenagers, some even had their parents with them. It was an all standing show, and we stood in the middle of the crowd to watch the acts. The only thing I didn’t like about the gig is that there was no TV screens, so unless you had a good view, you couldn’t see anything so it was hard to know what was going on when someone tall was in front of me. Don Broco was a supporting act, and me and Liam are massive fans! It was a great live gig, and we left boiling hot and sweaty, and looked forward to a good night sleep. We slept really well at the hotel, apart from some traffic noise from outside in the morning, but it was to be expected. We also had access to the executive lounge, but unfortunately we didn’t have time to try this out. Then the exciting bit.. breakfast! We were both really hungry in the morning as we didn’t have dinner the night before. So we were thoroughly looking forward to breakfast and it didn’t let us down. The choice was amazing and there was such a big variety I didn’t get to try everything. I started off with a selection of cold meats, cheese, pastries, olives, fruit and yogurt. It was all delicious and really fresh and tasty. They also had fresh apple and orange juice, as well we tea and coffee. 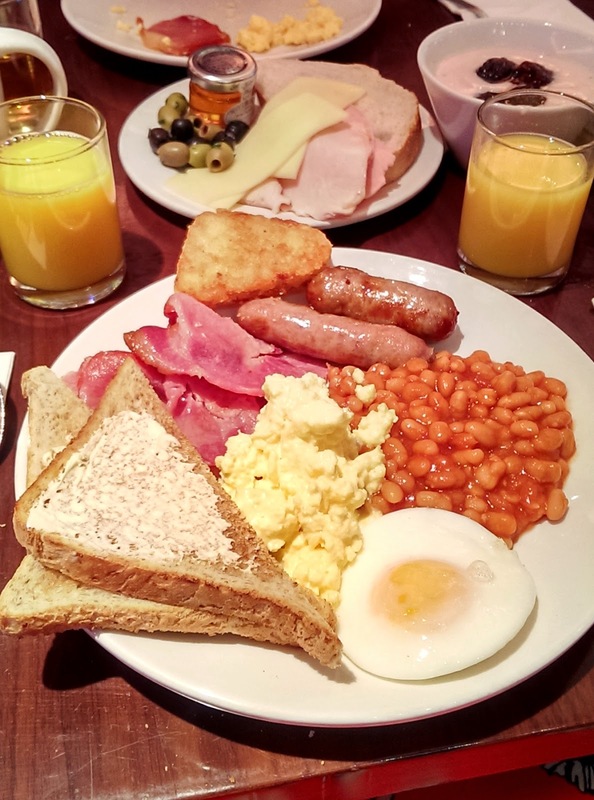 I then went up to try a big English breakfast and went a bit OTT, I had eyes bigger than my belly! The sausage was so good, and the eggs were also really great. The whole breakfast experience was amazing and I’d thoroughly recommend it! After breakfast we had a stroll around London, browsed Selfridges, and visited the National Gallery and Portrait Gallery. Liam’s a big lover of history and art, although I’m not a fan personally I supposed it’s good to get cultured sometimes! We then head back to the hotel again for our second meal of the day; afternoon tea. Now I love going for afternoon tea, it’s one of my favourite things to do, but Liam had never had proper afternoon tea before. I think he was secretly a bit excited, but he hid it quite well. Anyway we were offered a glass of champagne and a cup of tea (but we chose Coke) and then they brought out the three tier cake stand filled with goodies. We started with the sandwiches, which were salmon and cream cheese, egg, and ham. We then had a scone each, with clotted cream and ham, and then there was a selection of cakes. We were offered another round of food, so we had some more sandwiches, but we were pretty stuff by this point! The cakes and sweets weren’t really my kind of thing, but they were quite fancy looking. 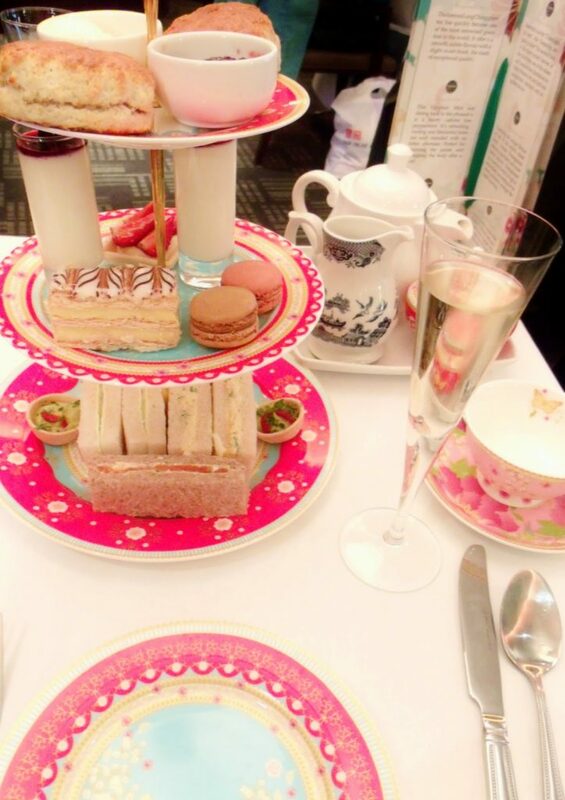 I loved that the afternoon tea was served on really sweet delicate colourful china, it made the experience more enjoyable than plain white crockery. The decor of the whole hotel was a little bit bland, but it’s probably better suited towards the business market than romantic weekends away. 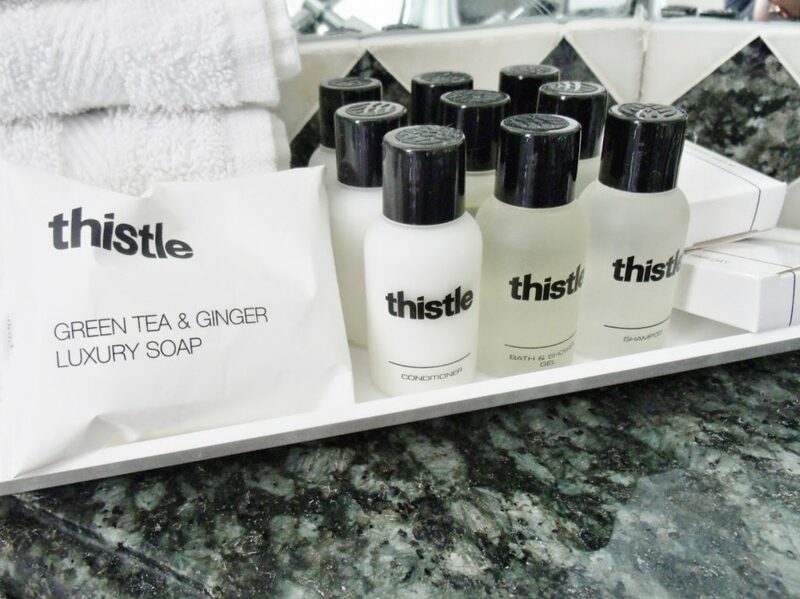 Overall I really enjoyed my stay at The Thistle in Marble Arch, and it’s ideally located near to the tube station, Oxford Street and other main shopping areas. 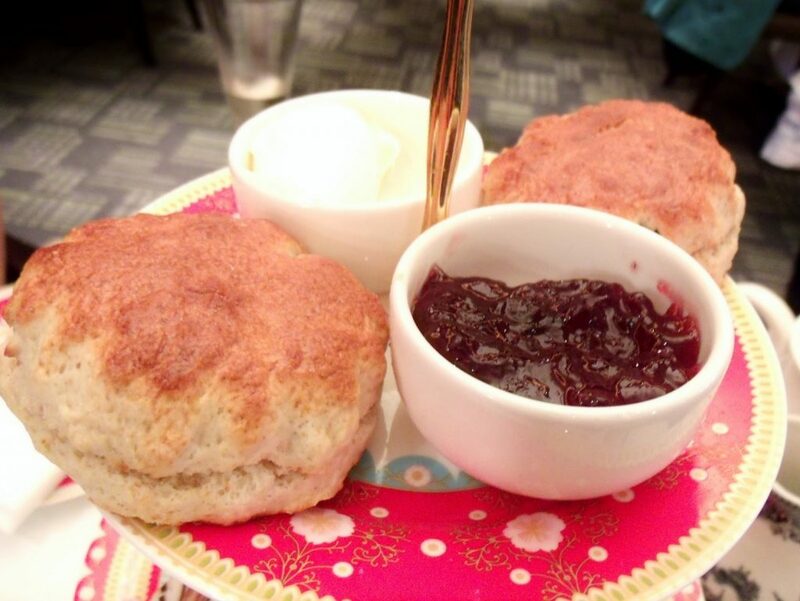 Looks lovely, especially afternoon tea – always a winner! Hope you had fun. Whenever I'm in London, I always go to the same Ed's Diner. I really like it there, especially the sweet potato fries. and their peanut butter milkshake is to die for!! We have one in Gloucester, and it's just not the same! wow everything at that place looks amazing! 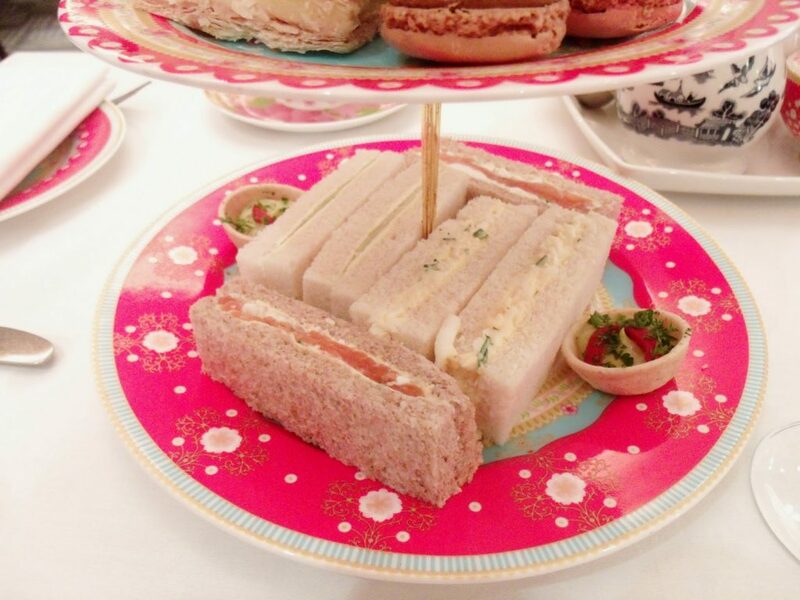 As lame as it sounds, one of my dreams is to go for a proper afternoon tea and this looks amazing! 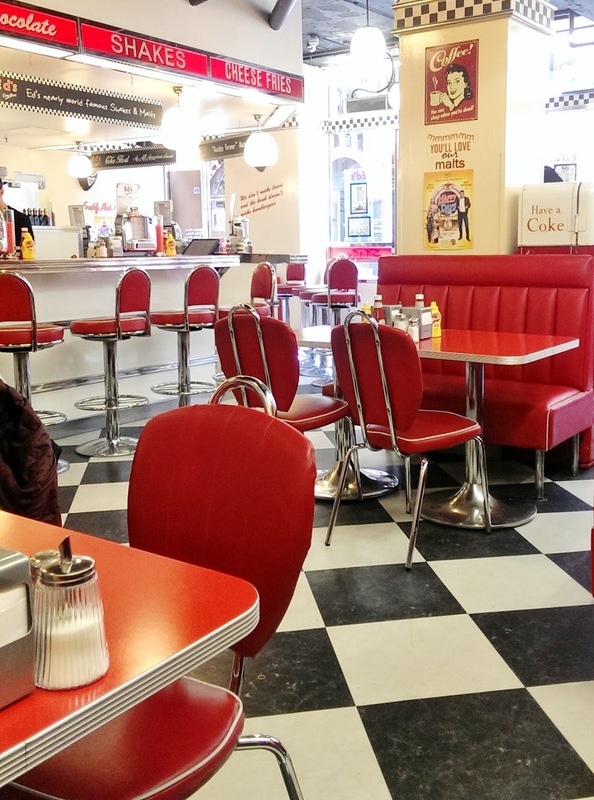 Never been to Ed's Diner, although we've got one in our city centre. Might have to take a trip there at some point, those milkshakes look delicious. Looks like you had a fab time, all of that food looks delicious! The food looks scrumptious. 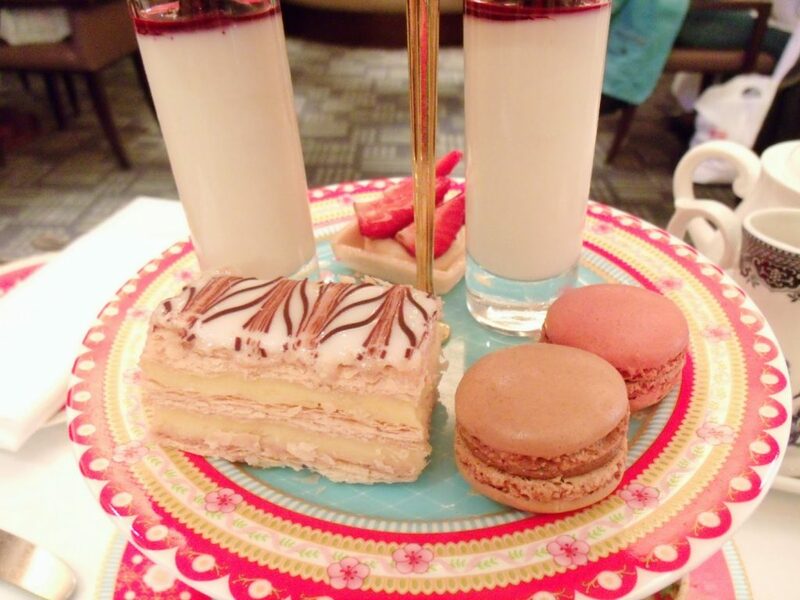 I'd love to go to London for Afternoon Tea. Lovely photos and the food looks yummy!